Did you know that most people spend more time with their coworkers than they do their own families? And just like family, your relationships with your colleagues can either be wonderful, nonexistent, or absolutely miserable. However, most of us find at least a few people that we “click with” and become quite good friends with. We begin to share information about or daily lives: weekend plans, daily interests, details about our families, and our opinions about a variety of personal topics. As this happens, professional barriers disappear and you become comfortable talking to each other. But there are a few areas of your life that should remain absolutely private! Below are 12 important things that you should never, ever tell your coworkers! Even if you and your coworkers are all unsatisfied with your jobs, never mention to anyone that you are looking for another job! Even if you feel that you can completely trust someone, don’t let yourself be tempted into mentioning it. Gossip and rumors can spread like wildfire! Even if your coworkers are trustworthy, they may accidentally let the information slip. If it gets back to management, you may very possibly lose your job. If you absolutely must have a job reference, be very discrete about it. Never list a manager or supervisor, even if you feel that they really like you. Keep quiet about this subject until you are fully hired by another company and ready to resign. If you need some assistance in this process, read my tips for successfully leaving a job, while still working. I know your boss may be an absolute nightmare, but constantly complaining about them is never a good idea. Your boss probably holds a significant amount of power and has the ability to make your life miserable. If you like to “let off steam” to your coworkers, your complaints will probably get back to your boss one way or another. Although you are adults, the gossip vine is just as bad as high school! If your boss becomes a seriously problem for you, consider making a formal complaint to Human Resources. However, this can also be very risky if you do not do it in the right manner. In the past, I decided to formally complain about my boss’s inappropriate behavior to Human Resources. Unfortunately, the HR Rep and my boss were casual friends and she unprofessionally told him about my concerns. Unless you can 100% stand behind your complaints and are willing to say them straight to your boss’s face, you should keep them to yourself. It is better to bite your tongue and remain professional then to make a bad name for yourself of badmouthing authority. Although this is a highly debated topic, I see more benefit in keeping your salary information private than to reveal it to others. (I wrote a whole article on the reasons smart people never share their salary information.) If you are a valued employee, chances are that you may be earning more than your coworkers. If you are earning more, jealousy and resentment are bound to spread! You and your coworkers live different lifestyles, with different budgets and expenses. If you are asked about your salary or finances, tell them that you have a “do not talk about your finances” policy at work. If you need financial advice from anyone, talk to a professional! Your coworkers do not need to be given information about your private financial situation. Please! Spare your coworkers your personal political opinions! We all get enough of this on our personal social media accounts. My policy: don’t talk about what you think unless someone directly asks you a question. Even then, I keep it short and sweet, avoiding the land mines of political discussions. Unfortunately, politics has the power to completely destroy coworker relationships – especially if opposing viewpoints are near and dear to the heart. In today’s political climate, it is better to refrain from bringing up politics – simply because it can cause an unnecessary rift with the people you work with every single day. I understand that your personal health may affect your day-to-day life, but you do not need to disclose your health issues to your coworker. Dave from across the office does not need to find out that you have a bladder infection, rash, or horrible period cramps. This is one of the important steps to being taken seriously as a career woman. Unless you have a serious allergy or condition that your co-workers should be informed about, it is always best to maintain your privacy regarding your health. If you disclose any information regarding your health, you need to be fine with everyone in the office knowing as well. Once it is said, it can never be undone. No one needs to know the personal details of your life! It is very common for other people to embellish or exaggerate the facts, if they share your story with others. Try to leave out the nitty-gritty details about your past relationships, family drama, and financial issues. If you are in the habit of sharing great stories about your life, you may be perceived as conceited and self-absorbed. You never know how people will interpret your stories! This is one of the reasons some people are always losing friends without even realizing it. If you have a secret crush on someone, keep it a secret! You don’t want that person finding out through the gossip vine. 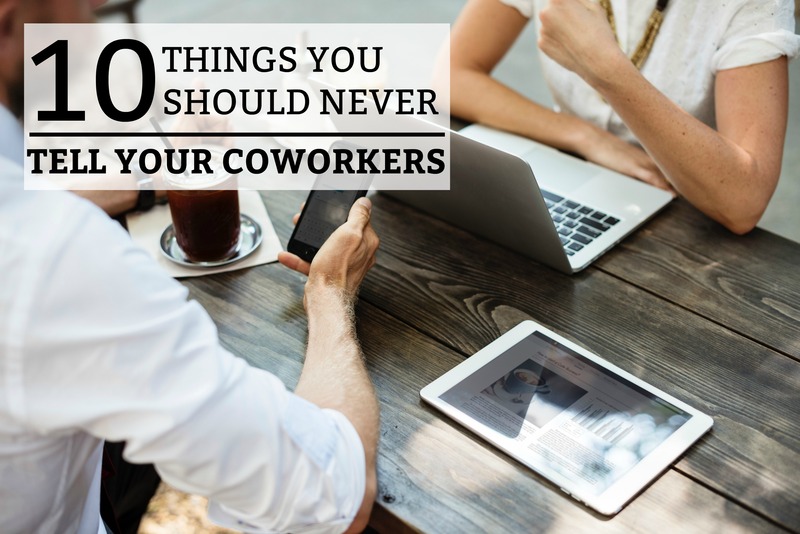 It can create an awkward work atmosphere if your coworker finds out and does not reciprocate the affection. However, if you both are interested in each other, don’t talk about it unless you are ready to tell your manager. Don’t brag about breaking the rules! That is an immature and novice mistake. For instance, don’t tell anyone if you called in sick when you just wanted to sleep in or go to the beach. It is no one’s business but your own. Just be careful, because breaking the rules can often come back to bite you – almost certainly if you tell someone else in the office! Take the safe road and keep your goals to yourself – noble as they may be! Even though it can be an unfair stereotype at times, women do get a “bad rap” for spreading rumors and creating exaggerated stories. Don’t let this behavior be something that you allow into your life. If a rumor is passed on to you, let it die! “I’m sure that person will improve over time,” or “If you feel this is an issue, you should go talk to them.” Allowing gossip to become a part of your life can be very damaging to your credibility. As a Christian, I love sharing my faith with other people. However, I strongly believe that you should not consistently bombard your coworkers with your religious viewpoints. It is always acceptable to share your religious beliefs if your coworkers ask you outright, but refrain from turning every conversation into an opportunity to share your faith. Remaining respectful and tolerant of everyone’s viewpoints is the foundation for a successful work environment. If you love sharing your faith, show your coworkers that you are a kind, hard-working, resourceful, and trustworthy. Often, your authenticity and good reputation will build trust and the opportunity to build good relationships with those around you. Coworker relationships are important, but you can also over-share your thoughts and personal opinions. In the future, try not to share the 10 things listed above. Remaining friendly, yet professional is the basis for a successful career.